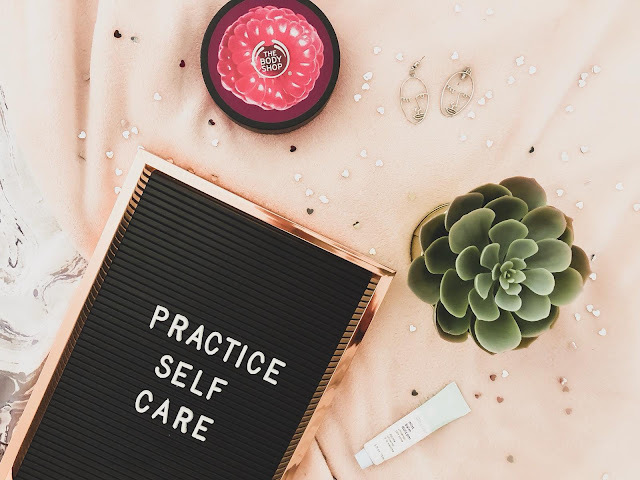 As a student in their second year, working a couple of jobs and managing a blog, it's safe to say that I struggle to take a step back and practice self-care. However, this is something that I've been working on over the past couple of weeks and so, I wanted to share my self-care tips. A couple of months ago, I spoke about how self-care doesn't have to be expensive or cliche and really, you've just got to do you so I'm not saying that you have to explicitly follow my tips but hopefully you can take inspiration from them and find your own ways to look after yourself. I'm quite an organised person and so, I tend to plan my day to day life either the night before or just before I'm about to start my day. However, until recently, I was forgetting to factor in breaks to these plans and so, I was basically burning myself out. Not good. Now I'm writing down when I plan to take breaks, writing them down and letting myself have that time to just do nothing. Doing nothing is something that I really struggle to do as I always feel as though I should be doing something but really, sometimes it's important to just break and take a step back. Having a set skincare routine and making sure you do this day and night is a good way to get yourself away from the screens and focus on nothing more than the task at hand. I used to be awful at just not doing my skincare routine in the evenings because I was 'too busy' doing work but now, I've realised to just stop and take that 10 minutes to let my mind destress and just focus on doing the one thing. This is something that I spoke about a while ago but sometimes, we make plans or arrangements and we have to cancel them because we are just not feeling up to it and that's ok. I feel such guilt when I have to cancel on meeting a friend or rearranging a meeting but I'm slowly acknowledging that you just have to put yourself first sometimes. Basically, if someone is really your friend or if something is really as important, it'll still be there when you're ready to get back to your day to day life. Often, when I'm reading self-care posts, the idea of ordering a takeaway or eating your body weight in chocolate is seen as the best way to make yourself feel better. While this may work for some people, I've learned that this is not something that works with me. In primary school, teachers always used to promote healthy eating with that phrase "you are what you eat", which you ignored as you and your friends left school at the end of the day to buy sugary drinks and the cheapest sweets your local corner shop offers. However, at the age of 20, I know that those teachers weren't lying. When I eat some fruit or just a healthy meal, I feel so much better than I would if I had a takeaway and also, the cooking of the food takes your mind off of whatever you have going on too so it's a win-win situation, really. Really, this can apply to any aspect of your life but for me, one of my biggest stresses is my emails. Whether it's regarding blogging, my other content creation work, my internship, uni or general admin (the list goes on really...), my inbox never manages to stay empty. A few months ago, I'd just close the tab and leave them unread until I felt mentally capable to sort it out. However, now, I'm prioritising, starring the important stuff, replying to those and setting myself a reminder to reply to the less important things at a later date. Feeling as though I'm not doing enough is so common for me so getting the important things done really helps me to feel productive and as though I'm slightly on track. Often, at university, I just need to sit and not do anything for a couple of minutes because let's be honest, it can be overwhelming sometimes. However, I often find myself panicking that I don't know what I'm doing if I just stop doing work. Therefore, breathing exercises are great to calm yourself as you are focusing solely on your breathing and it just really helps to calm you down. My fitbit offers a function to calm my breathing with breathing exercises, I'm sure there are apps to do this too or a simple search on Google if you're looking for some breathing exercises to calm you down. Clear room, clear mind and all that. For me, this is so true. My room at University is super organised and I have to make it this way in order for me to be able to do work in my bedroom. If my room is messy or unorganised, I'm constantly thinking about this and how cluttered it feels and it just makes my mind feel cluttered. On a similar note, making your bed every morning is one of the best ways to start your day in a productive manner because if you're like me and you have 5932 cushions on your bed, you're not exactly going to want to crawl back into the bed halfway through the day, mess up the layout and have to remake it. Maybe that's just me being lazy but it works for me. My life revolves around me being on my laptop or my computer for university work, my actual jobs or blog stuff. Therefore, I'm spending a whole lot of my day getting stressed about behind a screen. So, something that I'm really trying to work on is just getting up, going outside for a couple of minutes, getting some fresh air and letting myself have some time. Everything is still going to be there when I get back and honestly, being stuck behind a screen all day can have such negative impacts, it's just not worth it. Sometimes, the thought of practicing self-care kind of stresses me out. I see it as just being something else that I need to do and that shouldn't be the case. Remember that self care can be as simple as going to bed early or just watching a film. You don't have to be actively doing something for it to be classed as self-care. Honestly, this is such a wholesome way to make yourself feel better. If I'm feeling stressed, I just go onto Facebook or Youtube and find some sort of dog video and it automatically cheers me up. Because well, dogs. How do you practice self-care? Let me know! I always feel good when I eat healthily but when I'm down or ill, the craving for bad food is real! !